If you're looking for a great (and cheap!) hotel in Santa Barbara, CheapTickets is the best place to find them. We offer deals on the best 224 hotels throughout Santa Barbara. No matter what you're looking for, we have options for you. Grab great rates on the 68 affordable 3-star hotels that are easy on the wallet without sacrificing comfort. Looking for more luxury? 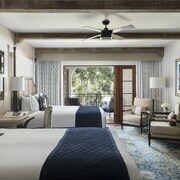 Try one of the 25, 4-star hotel accommodations in Santa Barbara. No matter your budget needs, we've pulled out all the stops to make sure you have plenty of vacation options. Maybe you prefer to search for your hotel deals based on what each hotel offers? For example, let's say you just want to find a hotel or resort that has a pool to cool off in after a long day exploring Santa Barbara. Scroll down to choose from the 96 hotels in Santa Barbara that has a pool for guests. Or search for deals on Santa Barbara hotels offering free wifi or breakfast, non-smoking rooms, and more! CheapTickets is here to be your personal travel agent for your next trip to Santa Barbara. Get booking today! What hotels in Santa Barbara offer free wifi access? Are there deals on Santa Barbara hotels offering free breakfast? Yes! The only thing better than finding a great deal on a cheap hotel in Santa Barbara is finding one that offers free breakfast. Grab some eggs, a waffle, or some healthy oatmeal before a day full of exploring Santa Barbara and all that it has to offer. Below are just some of the many hotels that offer free breakfast in Santa Barbara. Castillo Inn at the Beach is a 2.50 star rated hotel property in Santa Barbara that offers free breakfast. Montecito Inn is a 4.00 star rated hotel property in Santa Barbara that offers free breakfast. Sunset Motel is a 2.50 star rated hotel property in Santa Barbara that offers free breakfast. Brisas del Mar- Inn at the Beach is a 3.00 star rated hotel property in Santa Barbara that offers free breakfast. What about deals on pet-friendly hotels in Santa Barbara? Santa Barbara is a great place to get outside and explore with your pets in tow so don't leave your furry friends behind. Below you'll find great deals on hotels in Santa Barbara that allow pets. Don't forget to bring plenty of treats! 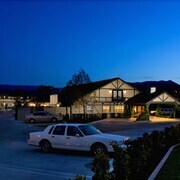 Wine Valley Inn is a popular, pet-friendly, 3.00 star hotel in Santa Barbara. Pacifica Suites is a popular, pet-friendly, 3.50 star hotel in Santa Barbara. Sandpiper Lodge is a popular, pet-friendly, 2.00 star hotel in Santa Barbara. Santa Barbara House is a popular, pet-friendly, 3.00 star hotel in Santa Barbara. Any good rates on Santa Barbara hotels with restaurants? Absolutely. Don't want to deal with planning our all your meals on your trip to Santa Barbara? We don't blame you. Keep the hangry away by staying in one of the 27 hotels that have restaurants. With a room at one of these spots, all it takes to get a good meal is hopping in the elevator. Check out some of the most popular hotels in Santa Barbara that have restaurants below. Book Best Western Plus Pepper Tree InnBest Western Plus Pepper Tree Inn is a 3.00 star hotel and has one or more restaurant options. 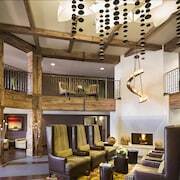 Book Kimpton Canary HotelKimpton Canary Hotel is a 4.00 star hotel and has one or more restaurant options. Book Best Western Plus Encina Inn & SuitesBest Western Plus Encina Inn & Suites is a 3.50 star hotel and has one or more restaurant options. Book Hotel CorqueHotel Corque is a 4.00 star hotel and has one or more restaurant options. What are the cheapest hotels in Santa Barbara with pools? What's better after a long day exploring Santa Barbara then a relaxing dip in a pool? Finding the Santa Barbara hotel you need for a bargain! Cool off and unwind at one of our 96 Santa Barbara hotels with a pool. Browse some of the top deals on these hotels and resorts with pools in Santa Barbara below, but be warned: You may not want to check out! Motel 6 Santa Barbara - Carpinteria South has a pool and a 2.00 star rating. Motel 6 Buellton - Solvang Area has a pool and a 2.00 star rating. Best Western Plus South Coast Inn has a pool and a 2.50 star rating. Hotel Milo Santa Barbara has a pool and a 3.50 star rating. What hotels in Santa Barbara offer parking for guests? Once you've made your way to Santa Barbara, the last thing you want to deal with is finding parking close to your hotel. Avoid the hassle of parking around the block and carrying your luggage all the way to the lobby by booking one of our hotels with parking. Check out deals on some of the 109 hotels in Santa Barbara that offer parking for guests. West Beach Inn- a Coast Hotel This hotel has a 3.00-star rating. Inn at Highway 1 This hotel has a 2.50-star rating. The Wayfarer This hotel has a 3.50-star rating. The Eagle Inn This hotel has a 3.00-star rating. Do Santa Barbara hotels offer 24-hour concierge services? When you're on vacation, things don't always go according to plan. Travel with peace of mind when you book one of our 42 hotels in Santa Barbara with 24-hour concierge service. That way you know help is always phone call or elevator ride away. Try Inn By The Harbor. 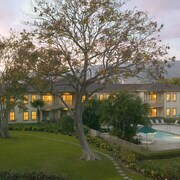 It's a 2.50 star rated hotel in Santa Barbara that offers concierge services 24 hours a day. 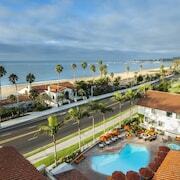 Try Hilton Santa Barbara Beachfront Resort. It's a 4.00 star rated hotel in Santa Barbara that offers concierge services 24 hours a day. Try Kimpton Goodland. It's a 4.00 star rated hotel in Santa Barbara that offers concierge services 24 hours a day. 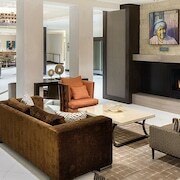 Try Hyatt Centric Santa Barbara. It's a 4.00 star rated hotel in Santa Barbara that offers concierge services 24 hours a day. What about low rates on non-smoking hotels in Santa Barbara? A White Jasmine Inn This hotel has a 3.00-star rating. Motel 6 Santa Barbara - Goleta This hotel has a 2.00-star rating. Best Western Beachside Inn This hotel has a 2.50-star rating. What are the cheapest Santa Barbara 3-star hotel deals? Our 3-star hotels bring you quality accommodations at a lower price point for the perfect, budget-friendly vacation in Santa Barbara. With 68 3-star hotels throughout Santa Barbara to choose from, you still have options. Browse our selection below. Hotel Milo Santa Barbara. Set amid fragrant gardens and graceful palm trees, Hotel Milo Santa Barbara is across from West Beach, between Stearns Wharf and the harbor, and near State Street. Best Western Plus Carpinteria Inn. Convenient to US-101, this Spanish-style hotel is half a mile from Carpinteria's famed beach and close to the Santa Ynez Mountains; Santa Barbara lies within 8 miles. Santa Barbara House. 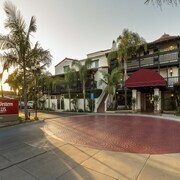 Located in East Beach, this hotel is within 1 mi (2 km) of Chase Palm Park and Santa Barbara Zoo. Presidio Santa Barbara and Santa Barbara County Courthouse are also within 3 mi (5 km). Pacifica Suites. 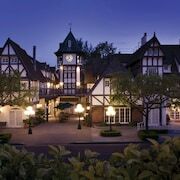 Situated in Santa Barbara, this romantic hotel is 1.6 mi (2.6 km) from Santa Barbara Orchid Estate and 2.9 mi (4.6 km) from University of California-Santa Barbara. Goleta Beach and Center for Urban Agriculture at Fairview Gardens are also within 3 mi (5 km). What are the best deals on 4-Star Hotels in Santa Barbara? Santa Barbara is full of hotels and it can be hard to narrow down where you really want to stay. Luckily, we've done that hard work for you be narrowing you from 224 hotels throughout Santa Barbara, to the 25 4-star hotels in Santa Barbara. Our 4-star hotels in Santa Barbara are exactly what you need for your next family trip, romantic weekend, or solo getaway. Check out our most popular deals below. Hyatt Centric Santa Barbara: Hyatt Santa Barbara is just across the road from East Beach, and a 5-minute walk from Santa Barbara Zoo. The MTD Waterfront Shuttle can whisk guests to the bars, restaurants, and galleries of State Street. Stearns Wharf pier is a 25-minute beachside stroll from the hotel. Montecito Inn: On a boutique-lined street in one of Santa Barbara's most upscale suburbs, Montecito Inn is a Mediterranean-style hotel surrounded by million-dollar estates and the San Ysidro foothills. Kimpton Canary Hotel: Evocative of a Spanish manor, this sophisticated urban retreat is a half-block from State Street, with its open-air shopping plazas, restaurants, shops, and the Santa Barbara Museum of Art. Hotel Corque: Situated in Solvang, this hotel is within a 5-minute walk of Solvang Vintage Motorcycle Museum and Solvang Festival Theater. 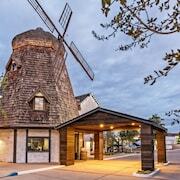 Mission Santa Ines and Hans Christian Andersen Museum are also within 10 minutes. What are the best activities to do in Santa Barbara? Beach Dune Buggy Rental: Starting at just $222 per person. Urban Adventure Quest - Santa Barbara: Starting at just $8 per person. Original Downtown Food Tour: Starting at just $79 per person. Mountain Bike Tour - Beginner or Intermediate: Starting at just $105 per person. What are the most popular attractions in Santa Barbara? People travel to Santa Barbara from all around to witness the incredible sights and attractions. With 2 sights to see during your stay, you're sure to have a busy trip in Santa Barbara. Below, we've listed some of our favorites. The staff were friendly and accommodating. I enjoy my stay in Santa Barbara. It looked like it had a balcony and it didn't and when i called front desk, a few times i never got an answer. Excellent location! The hotel has a great concept and the best thing about it is the staff. They are very helpful and have a great attitude. My dog was treated like another guest and got a lot of love. Rooms are comfortable, bright and the decor is amazing. Definitely staying again there soon!